It is the IKEA PS FÅNGST. 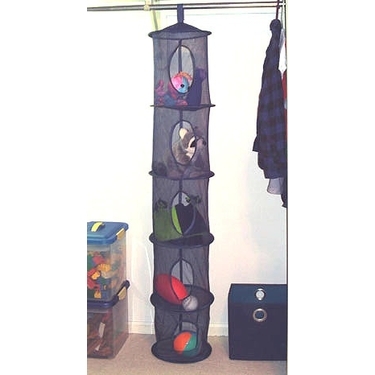 A Hanging storage tube thing made of mesh with 6 compartments for $4.99. It was 8.99 many years ago and they had more colors... i guess they are being phased out. you put a nut in 1 or 2 compartments every night and the squirrel spends a good 20 minutes checking every section for the nut several times a night. They used to have smaller 4 section ones as well. Last edited by KyAndPete on Sat Dec 17, 2011 11:19 am, edited 2 times in total. Ohhh, some brands align the entry holes. If you buy one try to buy one where the holes are not aligned. It makes the squirrel have to think more about how to get in the next chamber. I had a little one where they were all aligned and he didn't have to work as hard for the nut so i gave it away. Random entry holes are better. 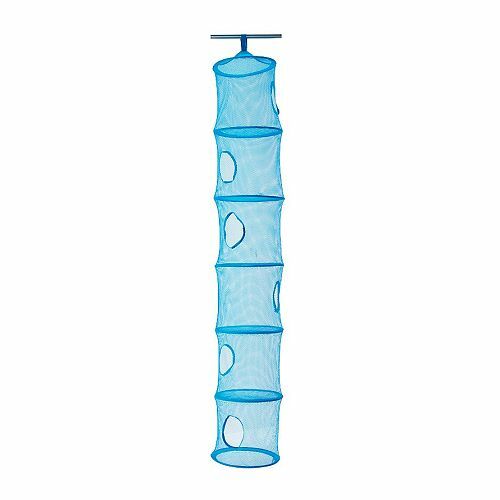 He also loved to jump from the MANY little launchpads (squirrel shelves) we had around the room and grab onto this thing mid air. It was super forgiving, easy to grab (mesh), and let him swing after grabbing it mid flight. Also the IKEA ones were sturdy enough to put in the washing machine.